A great Christmas & Birthday gift for your children ,your friends and yourself. Color:As picture showed,send by randomly. √【VARIOUS STYLE】Differet style and diffrent color of daily casual dress outfits,dress up your doll according to your aesthetic. √【MEANINGFUL PRACTICE】Suitable for young parents to do some parenting practice and helpful for children to develop a good habit of self-reliance.good habit of self-reliance. √【EASY TO US】Our doll clothes were specially designed with zippers and velcro so while your little one will have the best time playing & you will be able to do some of your work without being disturbed. We know that the life of a mother is not always easy. 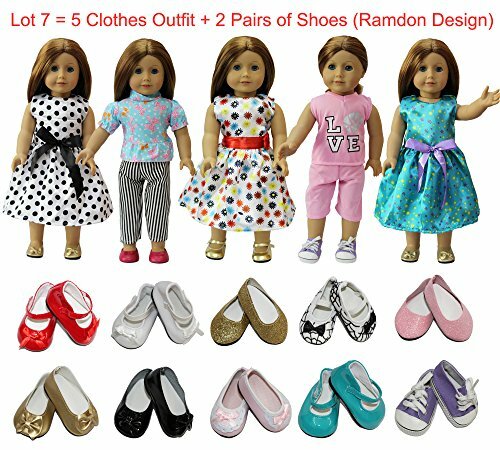 √【CUTE PACKAGE】 5 Daily Costumes Gown Clothes+ 2 Shoes are well packed in a cute case printed with logo. √【ABOUT US】Made by ZITA ELEMENT , Leading Doll Clothes & Brain Creative Product Manufacturer.